2014 – Miller & Associates moves into their new offices in Carrollton, TX. 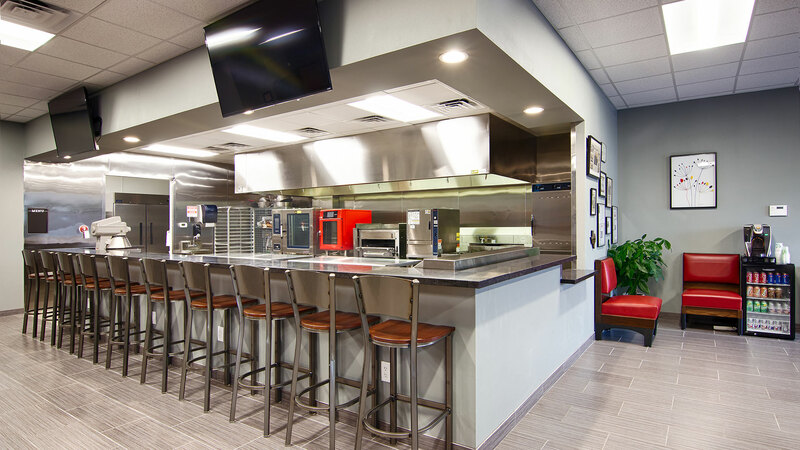 The new office features a fully operational Culinary Center, training and showroom. 2006 – In November Bobby Watson and Jeff Griffiths formed a partnership that purchased Miller & Associates from Margery Miller. 1989 – Margery purchased Michael’s share of the business and became its sole owner. 1984 – Milo Beaver left the company, and it became Miller & Associates. At this time, Michael Miller and Margery Miller became the sole owners of the company. 1982 – Bob White left the company and the name was changed to Miller-Beaver Associates. 1979 – Milo Beaver joined the company as a partner, and the name was changed to Miller-White-Beaver. 1977 – Michael Miller joined his father as a partner in M&A in May 1977. Pat and Mike merged the business with Bob White. The company was called Miller & Kershaw-White. Margery Miller joined to run the business of the company. 1974 – Michael Miller joined his father as a sales person. 1957 – Miller & Associates was hired to Represent Groen Kettle Company. Pat continued as the Rep in the five state region until the late 1960’s.At that time, the territory was changed to Texas and Oklahoma. 1952 – Pat Miller moved to Dallas, Texas from Mobile, Alabama and founded Miller & Associates. M&A was the Champion Dish Machine Rep. in Texas, Oklahoma, Louisiana, Arkansas, and Mississippi.